Rockstar's Red Dead Redemption 2 became available to buy in physical and digital forms, and in console bundles, on Friday. Now we are hearing that the game has chalked up enviable sales and revenue to become the second biggest entertainment industry launch ever. It has generated over $725m in revenue over its first three days of availability worldwide. The game was highly anticipated and has garnered rave reviews, and comes in second place in ents industry revenue rankings, behind only GTA V ($1b in 3 days). 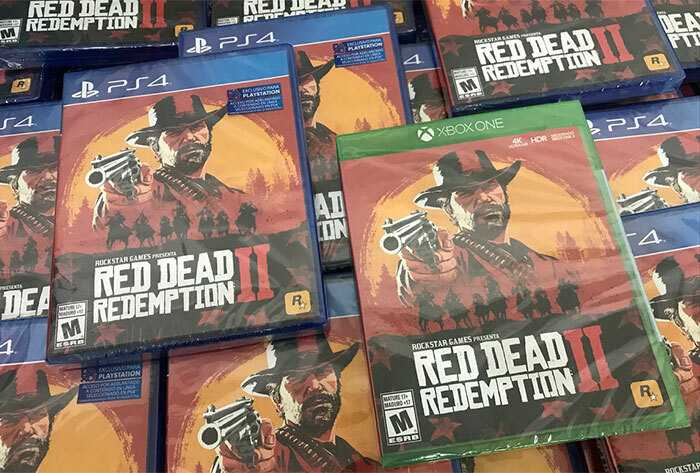 Sony's stats showed Rockstar's latest success was ever greater as RDR2 and it "set new records on the PlayStation Network for highest ever pre-orders, highest day one sales and highest sales for the first three days in market." If your internet was slow this weekend it might have been impacted by all the gamers downloading this 100GB+ behemoth. "An epic tale of honour and loyalty set in the dying days of the outlaw age, Red Dead Redemption 2 follows Arthur Morgan and the Van der Linde gang as they rob, steal and fight their way across the rugged heartland of America in order to survive. 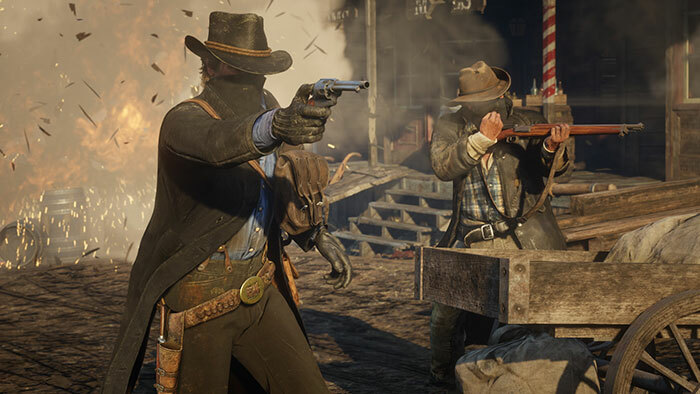 Following a botched robbery in the western town of Blackwater, the gang is forced to flee and, with federal agents and the best bounty hunters in the nation massing on their heels, deepening internal divisions threaten to tear the gang apart, leaving Arthur to make a choice between his own ideals and loyalty to the gang who raised him." 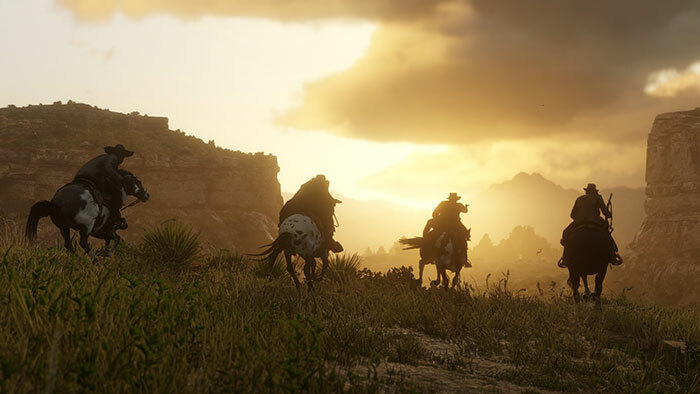 Red Dead Online, a connected experience set against the backdrop of Red Dead Redemption 2's enormous open world, is set to launch in November. The previous Red Dead Redemption game never came to PCs, and so far there is no official indication that RDR2 will be launched on PC. Gamers reason that because GTA V was successful in its PC sales that Rockstar should naturally port RDR2 over. It isn't just blind hope, there have been little clues and possible indications that RDR2 will indeed come to PC. A couple of days ago someone data-mined the official RDR2 companion app and found strings containing 'PcVersion', various out of place PC graphics options, and reference to the Oculus HMD. A previous tantalising clue came from a Rockstar employee whose LinkedIn profile mentioned RDR2 PC. As a reminder, it took Rockstar almost a year after the console debut of GTA V to confirm it would be launched on PC. If you decide to go console for this game - and perhaps some other titles and the STB utility value of such hardware - Digital Foundry says that the best version is on the Xbox One X as it runs at 30fps at native 4K only on this platform. I've been playing this on a standard ps4, I am using a gaming monitor and external speaker set up so it may look and sound bit better than it would on a large TV, however you can tell it is running sluggishly at times for sure. That being said it is still the best game I have ever played to date in terms of how alive and detailed the world is, you can just lose yourself so easily in this game. The amount of times I forget what my main mission goal is and up on an adventure because of some random event is just amazing. I am enjoying it that much that I will probably be suckered into buying a second copy for the PC when it comes out. I anticipate the online to be a cash grab again like GTA online was, but this is a game I wouldn't mind grinding on so much as it would fit the feel and idea of the game a lot more than it did with GTA. it took Rockstar almost a year after the console debut of GTA V to confirm it would be launched on PC. Which is why I didn't bother buying it. The same will be true to RDR2 if it comes to PC. Basically if a developer is too lazy or blind to not develop for all of the main 3 platforms (could be argued that Switch is also another platform that should be supported), then I don't support that developer. Period. My girlfriend and I have been playing it on the PS4 Pro on a 4K TV and it looks absolutely fantastic, save for some small artifacts that are generated around static objects while moving quickly. At first I thought it was perhaps the TV doing this so I swapped it over to a 4K monitor and got the same issues. The rest of the time it looks absolutely stunning though. I'm with you on that one. I will absolutely pick this up on PC if it comes out. I bought GTA V on the PS3, PS4 and PC. I think Rockstar made the decision to ditch PC releases after early gta's in the 2000's as after launching on consoles sales were much better than pc and most of the pc games that were released alongside consoles back in the day just ended up on pirate sites. Although the protections are much better developers still get ripped off especially back in the day. Also eases work cycles of dev teams i'm guessing. It looks and smells like a pc game, the 30fps again is probably just holding back so the port is easier to each console etc but thats just my 2cents.